I love the snow. As long as it’s out and I’m in. Despite the romantic appeal of the sound of the crunch of snow beneath a pair of brand new leather boots on a starlit Christmas night, snow is cold. Too cold for me. 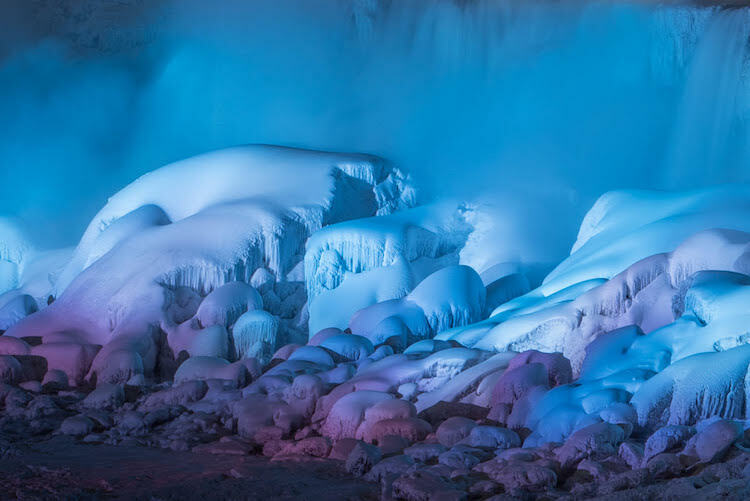 Growing up in Canada, winter days could get so cold that not only did the freezing temps blanket the ground with two feet of white fluff, a severely cold winter could cause the falls to freeze over completely. That's happened this year, the cold snap transforming the falls into something from a sci-fi flick. Back in my day, along with those snowfalls came some painful cases of popsicle toes. As a child, I’d hobble in from outside and stand next to the radiator, pain stabbing at my feet, tears pricking my eyes while my mother gently unbuckled my snow boots so she could rub my numb feet back to life. Living in Southern California my snow days, thankfully, are far behind me. Winter—real winter—has just never been my season. Even when my father made an ice rink in our backyard, hosing down the backyard, freezing slowly layer by layer, I never liked skating. My ankles hurt, and to be honest I wasn't very good at it, lurching around the skating rink like a toddler trying out their first steps. I went skiing a few times in my early twenties; spent a few weekends at Mammoth and Big Bear. Again, my ankles hurt, my muscles ached, but mostly my toes were just too damned cold. You go ahead and conquer the mountain, you can tell me all about it apres ski. I'll be inside with the fireplace, hot toddies and the munchies . While there have been winters when I’ve forgotten how much the cold and I do not see eye to eye, a quick trip up the 10 to Arrowhead or Big Bear reminds me I’m over that bad boy. I’m happy to live somewhere kids make angels, not in the snow, but in the sand. When our son Russell was growing up, the weather was never a reason to cancel school. Snow days? Not a thing. Speaking of Snow Days, here's a Throwback Thursday story about one of mine.